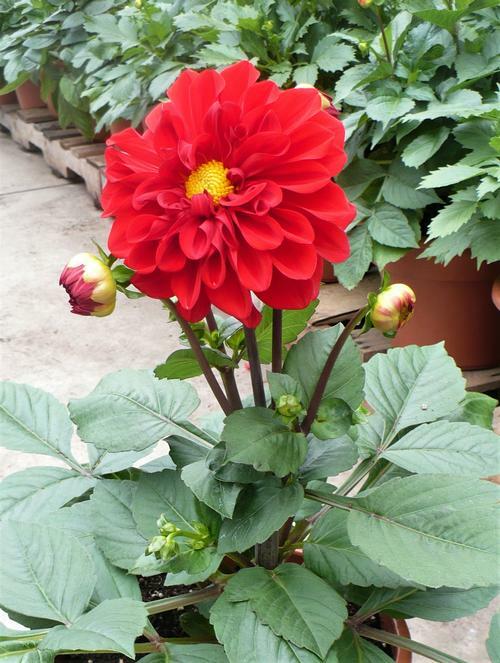 Perfect dahlia for patio containers, no pinching or staking, 75 days grow time, 1 tuber per 8-10" container. Dahlias make excellent pot plants and/or patio containers. They bloom summer till frost, providing that late summer color to the garden when most perennials are past their prime. Dahlias are also a favorite holiday crop, especially for Easter and Mother's day. Planting: Plant tubers so the crown is at or just below the soil surface. Eyes should be visible or will develop where the old stem and tubers meet. Be gentle, some tubers are delicate and easily broken if handled too rough. Watering: Keep pots evenly moist but not too wet after potting. Too much moisture may lead to crown and root rots. Once growth begins, more frequent watering will be necessary. Temperature: Grow Dahlias warm at 70 - 75F days. Light: Dahlias require high light intensities, full sun for best growth. Fertilizer: Dahlias are heavy feeders, especially the tall patio types. Once foliage is present, apply a slow-release top dressing or liquid feed with a well-balanced fertilizer at 200 ppm N.
Plant Growth Regulators: A-rest is effective in controlling height on dahlias. Apply as a drench when shoots are emerging from the soil, usually 2 - 3 weeks after planting. Pinching: Pinching can help to control height and will produce more bushier plants with more flowers. Pinch early, after 3 - 4 leaf pairs. Pot dahlias do not require any pinching.